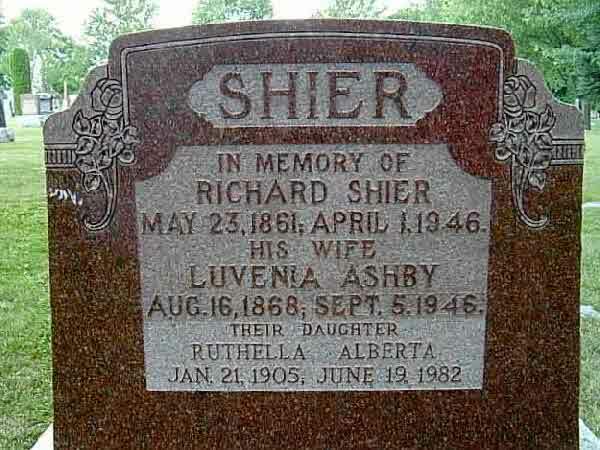 Marriage* She married Howard Richard Francis, son of George Francis and Margaret Shier, on 28 February 1923 in Hunta, District of Cochrane, Ontario, Canada. 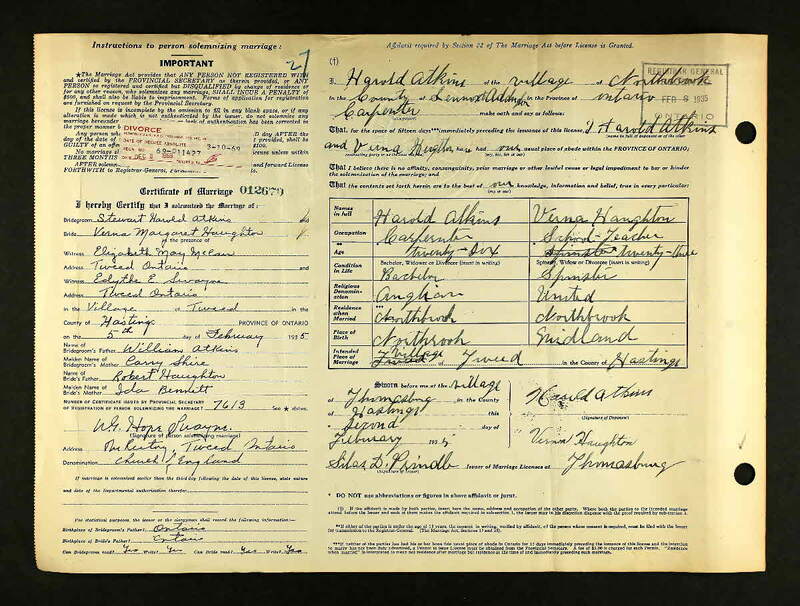 Marriage* She married Richard Shier, son of Richard Shier Sr. and Margaret Dawson, on 20 December 1893 in Cannington, Ontario County, Ontario, Canada; Reg NUmber 49688. 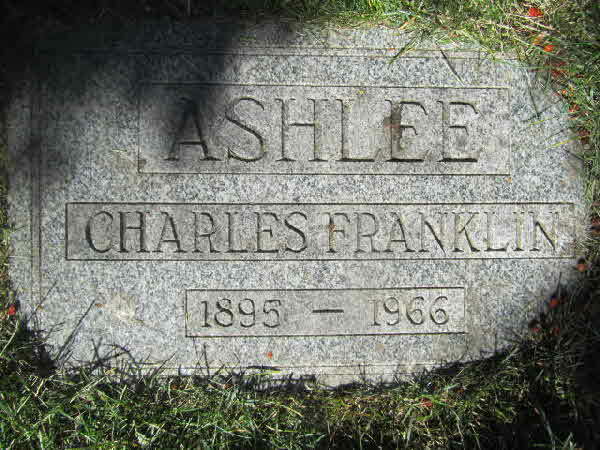 Birth* Charles Franklin Ashlee was born on 16 June 1895 in Toronto, York County, Ontario, Canada. 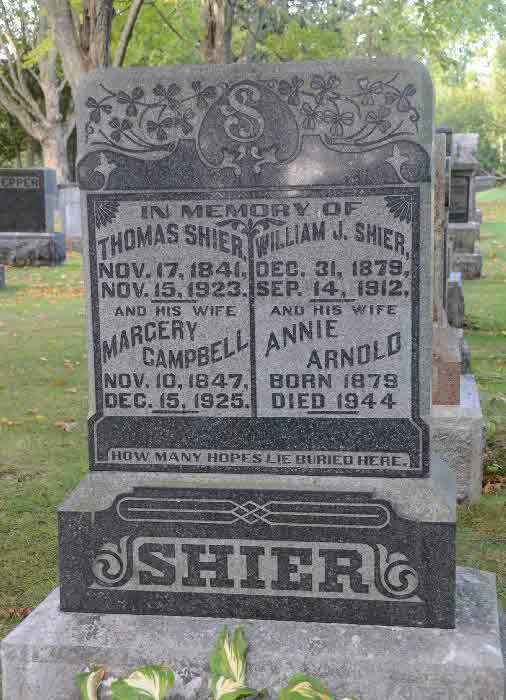 Burial* He was buried in Hillside Cemetery, Kamloops, Thompson - Nicola Regional District, British Columbia, Canada. 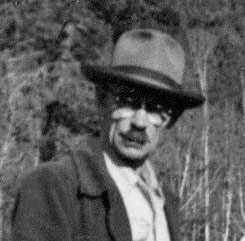 Birth* John Speiran Ashlee was born on 25 January 1900 in District of Rainy River, Ontario, Canada. 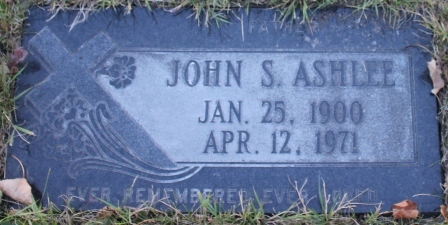 Death* John Speiran Ashlee died on 12 April 1971 in Dawson Creek, Peace River Regional District, British Columbia, Canada, at age 71; Funeral services for the late John Speiran Ashlee, 701 - Avenue, Dawson Creek, were held Thursday April 15 from Reynar's Funeral Chapel. Rev. 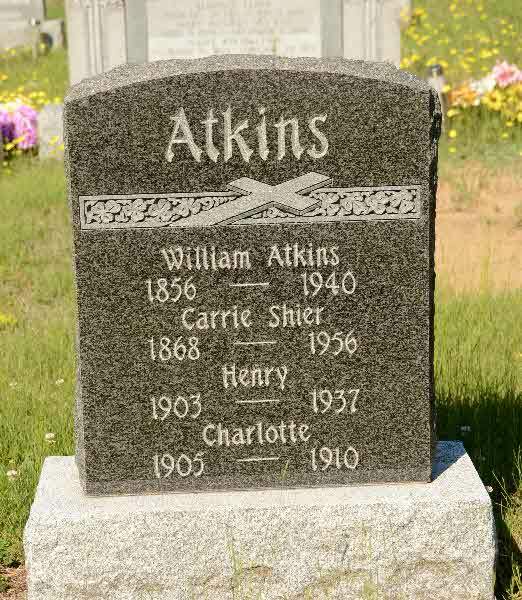 M. K. Collison officiated and interment followed in the Dawson Creek city cemetery. 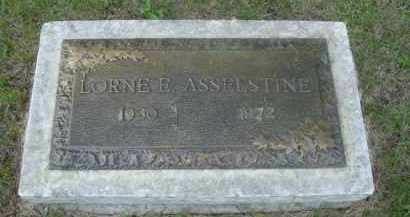 The late Mr. Ashlee was born January 25, 1900 in Rat Portage, Ontario. 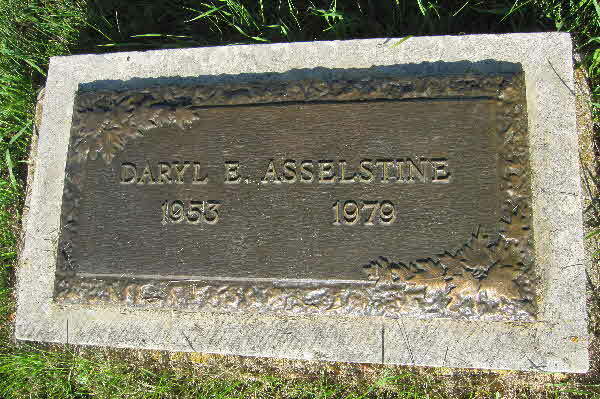 He came to Dawson Creek 25 years ago and passed away suddenly April 12th. 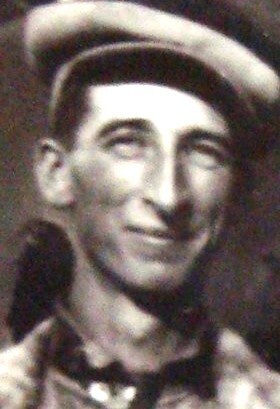 Surviving besides his living wife Charlotte are four sons, Walter, Leonard, and Patrick of Dawson Creek and Jack of Lloydminster; one daughter, Mrs. Margaret Friesen of Edmonton; one brother Tom of Kamloops; two sisters, Margaret Powell of Mesa, Arizona and Mrs. Ann Burge of Vancouver; ten grandchildren. ?Donations of Sympathy were gratefully received to the Cancer fund. Peace River Block News, 21 April, 1971. 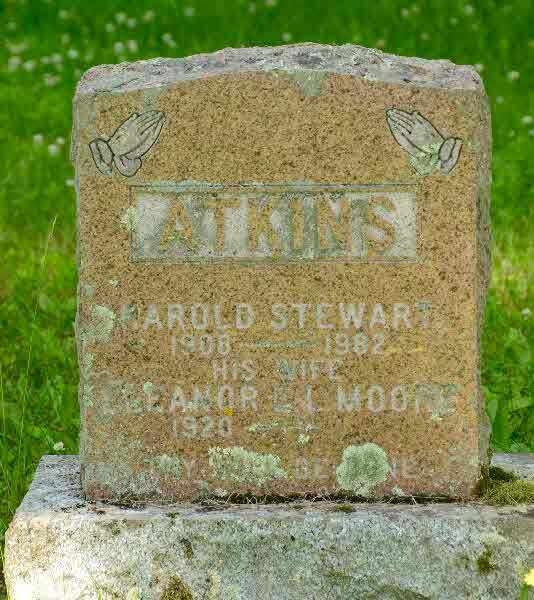 Marriage* Harold Stewart Atkins married Verna Margaurite Haughton, daughter of Robert G. Haughton and Ida Emily Bennett, on 5 February 1935 in Tweed, Hastings County, Ontario, Canada. 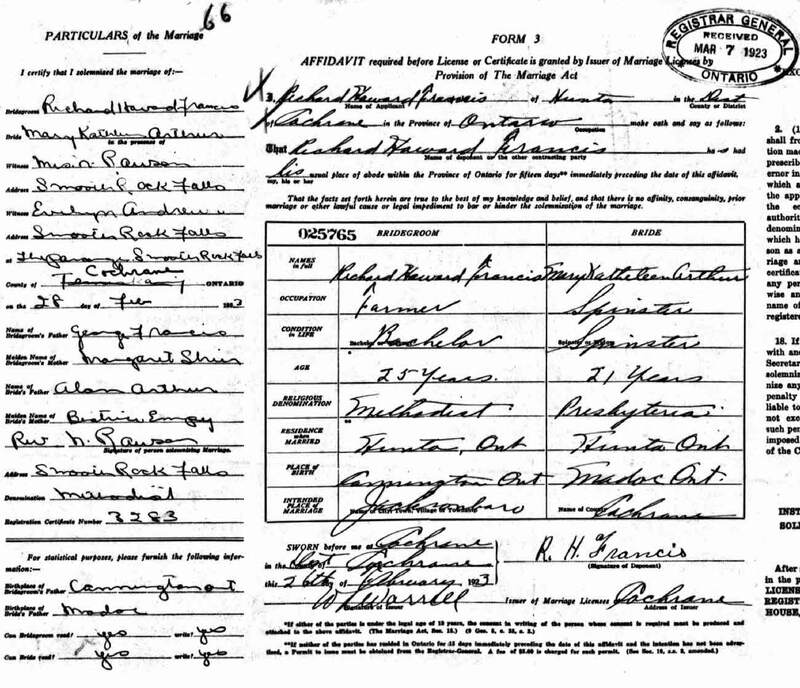 Marriage* Henry Walter Atkins married Dorothy Pearl Pringle, daughter of Dexter Pringle and Marguertie Wilson, on 13 June 1935 in Tweed, Hastings County, Ontario, Canada. 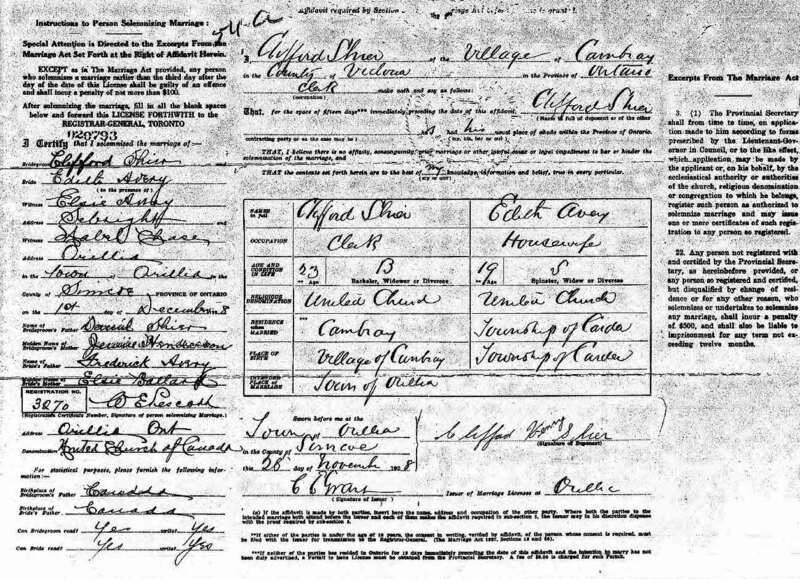 Marriage* Samuel ERWIN Atkins married Mary Ellen Hilts, daughter of Jonas Hilts and Hilda Hiscott, on 23 December 1918 in Toronto, York County, Ontario, Canada. 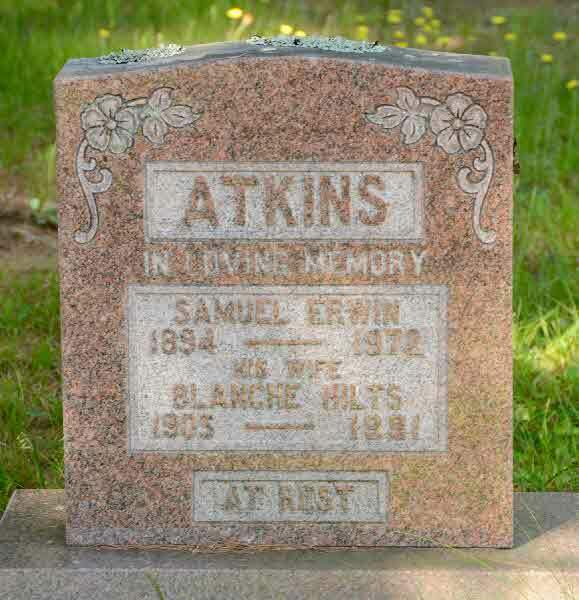 Burial* He was buried in Northbrook United Church Cemetery, Lennox and Addington County, Ontario, Canada. 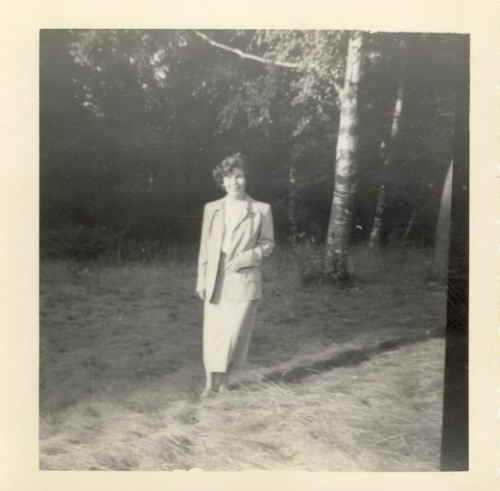 Birth* Tressa Eileen Atkins was born on 20 July 1913 in Kaladar Angelsea Effingham Twp., Lennox and Addington County, Ontario, Canada. 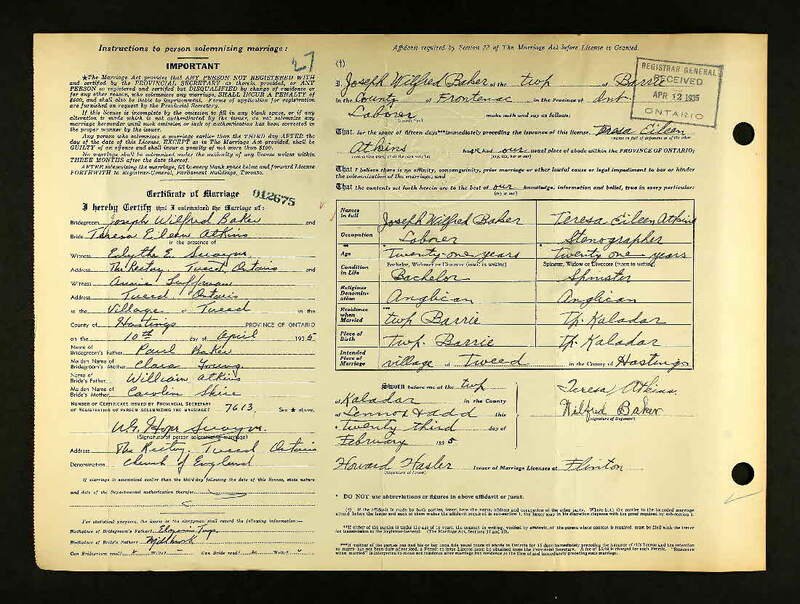 Marriage* Tressa Eileen Atkins married Joseph Wilfrid Baker, son of Paul Baker and Clara Young, on 10 April 1935 in Tweed, Hastings County, Ontario, Canada. 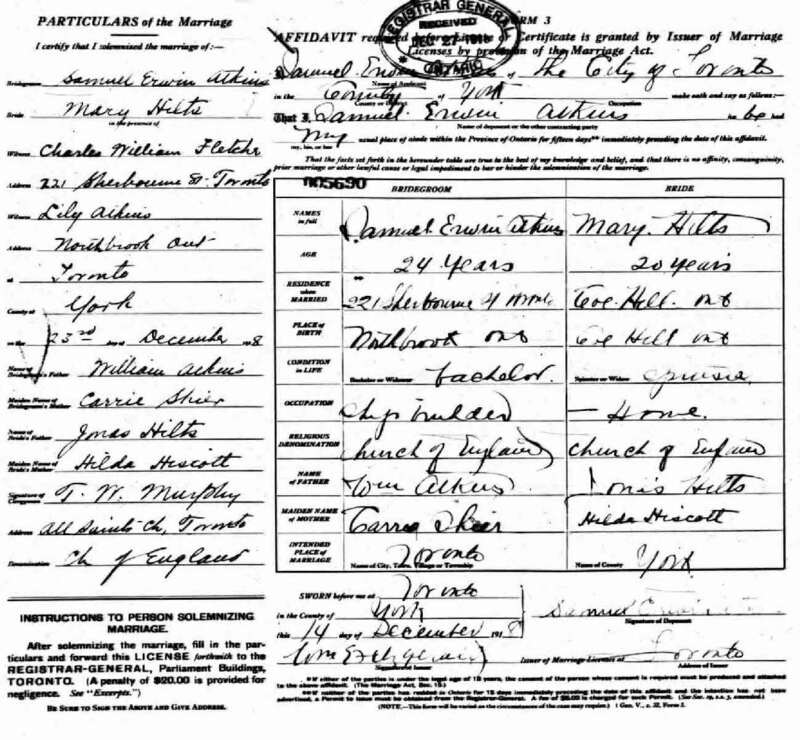 Marriage* She married Joseph ROY Kennedy, son of David William Kennedy and Mary Edith Moffat, on 14 October 1919 in Toronto, York County, Ontario, Canada; Divorced in 1925, divorce secured in Michigan. 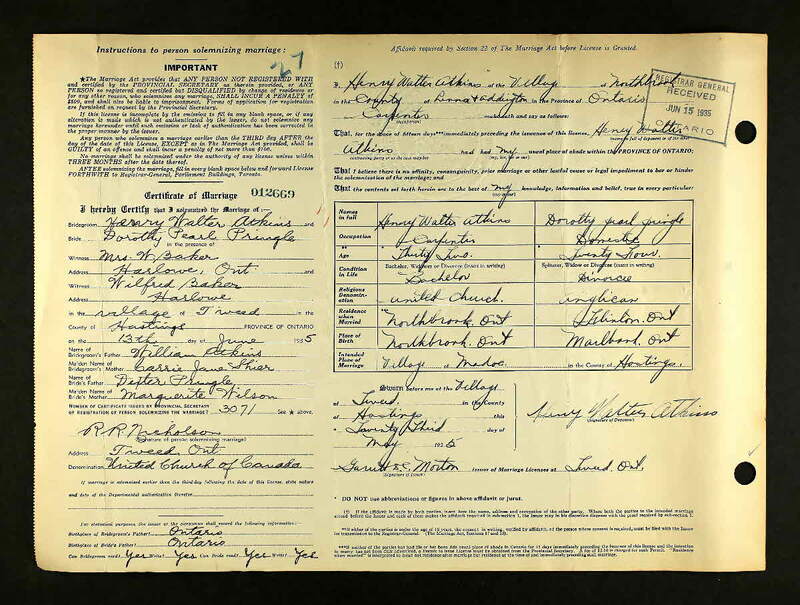 Birth* Edith Beatrice Avery was born on 2 May 1909 in Carden Twp., Victoria County, Ontario, Canada. 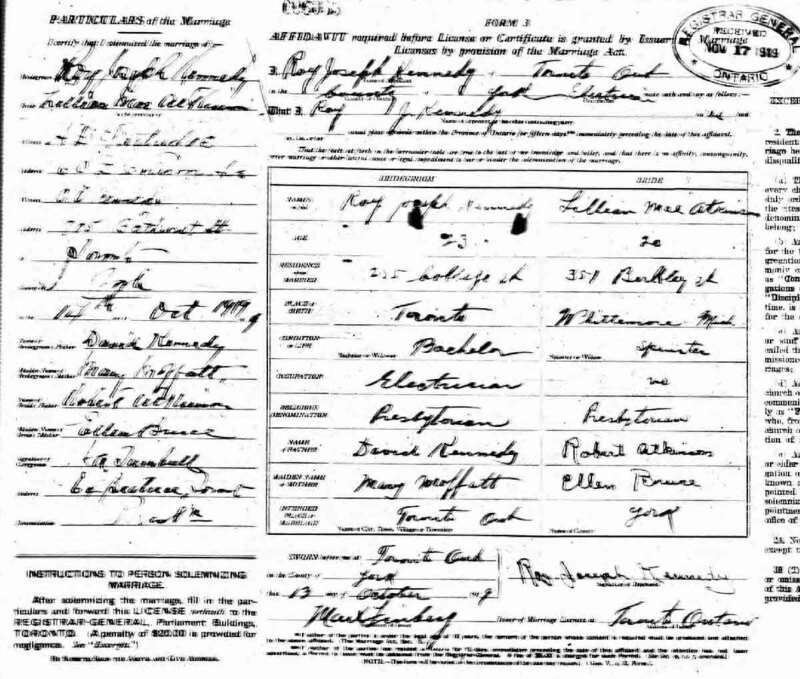 Marriage* Edith Beatrice Avery married Clifford Henderson Shier, son of Daniel Phillip Shier and Jennie Henderson, on 1 December 1928 in Orillia, Simcoe County, Ontario, Canada.